Crete, IL – June 12, 2017 – Derek Braun of Lexington, Kentucky, wowed crowds with a spectacular win in the $50,000 Purina Animal Nutrition Grand Prix on Saturday, June 10th. Braun, riding Lacarolus, owned by MRN Family Corp, claimed top honors by executing the only double clear rounds over the course. Braun described the course, designed by Anna Catalina “Catsy” Cruz Harris, as pretty technical and high. 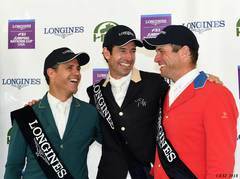 “We were 17th in the order, and only one had gone clear, so I knew if I just jumped clear and had a nice round that I would have done a good job,” he said. By the end of round one, Annabella Sanchez, 16, was the only other competitor who had advanced to the jump-off. Sanchez returned to the Grand Prix Stadium first atop her beloved Cassano Z. She boldly addressed the shortened track with extreme speed, and stopped the clock in 43.64--but a rail had fallen during her round, which handed an advantage to Braun. When Braun galloped through the starting timers, a hush fell over the Grandstand. With carefully deployed precision, he guided Lacarolus high above one jump at a time to a faultless round in 46.446–and earned $15,000 for the effort. This victory is the first win for Derek Braun at the Balmoral Park venue. Braun refers to Lacarolus as the smartest horse he has ever worked with in his life. The two have collected many accolades in their eight years together. “We know each other really well, and I know what he is going to do and when he is going to do it, and that has really helped me along the way not just in this class, but in all classes,” he described. Lisa Goldman, the fastest of the four-faulters in round one, took home both third and fourth place with her trusted partners, Hindsight and Centurion B, respectively. Rounding out the top five was Giavanna Rinaldi riding Show Show, owned by Alex Jayne. Immediately preceding the Grand Prix, HITS Founder and CEO, Tom Struzzieri, along with Crete Mayor Michael Einhorn and Southland CVB President Jim Garrett, presided over the inaugural ribbon-cutting ceremony to officially re-open Balmoral Park. The three leaders welcomed the community to celebrate the new life of Chicagoland’s beloved race track as a state-of-the-art equestrian complex. For many in the wider Crete community, this marked the first time they had ever seen show jumping of this magnitude. The Showplace Spring Spectacular Series continues at Balmoral Park for the next two consecutive weeks.